A mysterious circus terrifies an audience for one extraordinary performance before disappearing into the night . .
Two teenage boys crash a party and meet the girls of their dreams—and nightmares . . . In a Hugo Award–winning story, a great detective must solve a most unsettling royal murder in a strangely altered Victorian England . . . These marvelous creations and more showcase the unparalleled invention and storytelling brilliance—and the terrifyingly dark and entertaining wit—of the incomparable Neil Gaiman. By turns delightful, disturbing, and diverting, Fragile Things is a gift of literary enchantment from one of the most original writers of our time. This is a must-read for fans of Neil Gaiman. Probably not the best introduction to him though. This collection of short stories features works that are all enormously fun, darkly twisted, humorous, and thought-provoking. My favorite part of this reading experience was actually reading the introduction. In the introduction, Gaiman discusses a little bit about the making of the story and its publication and/or awards history. Having previously read American Gods and Anansi Boys in pretty short succession, I was a little hesitant about diving into more Gaiman. But it happened that I was in a period of my life where the only time I had to read was right before bed and I had so much to do, I didn’t want to get engrossed into a novel and waste an hour of the little sleep I could get. Enter Fragile Things. Reader be warned, many of these stories are ghost stories, monster stories, and alien stories. I am not a scary-story reader and I was able to read these at night. Though there were a few I don’t recommend ending your night on: “Closing Time”, “Feeders and Eaters”, “The Facts in the Case”, “How to Talk to Girls at Parties”. These stories, while enjoyable, are also pretty dark and twisted. Which is why I don’t recommend them to a Neil Gaiman newbie. Cut your teeth on one of the other books, get a taste for his style, and then check out Fragile Things. I don’t read a lot of short story collections (I usually prefer novels), so I can’t say how this stacks up against others. But Fragile Things is full of solid, award-winning stories. There are a few Hugo award-winning stories in here. In addition to the stories, there are smatterings of poetry. Gaiman’s poetry is lyrical and accessible, not at all the incomprehensible mush that emerges from experimental poetry classes. (I should know, I like that incomprehensible mush). His poetry is more reminiscent of the oral tradition style poetry, rhythmic and easy to follow. I should mention how much of a delight Fragile Things is for the consummate reader. Gaiman is constantly showing off his well-rounded knowledge of literary history, but not in a snobbish way. He touches everything from Sherlock Holmes to Beowulf to The Chronicles of Narniato The 1001 Nights to Aladdin to Goldilocks and the Three Bears to The Matrix, rounding it all off with an American Gods novella, set two years after the end of the events in that book. Fragile Things is a literary feast. I hadn’t heard of this collection, so thanks for opening my eyes to it! 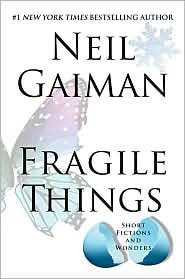 Gaiman has such a fertile imagination, it would be great to read his short stories – and I’m curious to see what his poetry is like too. I’ve thought about reading this and I think you’ve convinced me! I’ve read a couple of Neil Gaiman’s books (Stardust and Neverwhere) and loved both. Ah! The two I haven’t read!